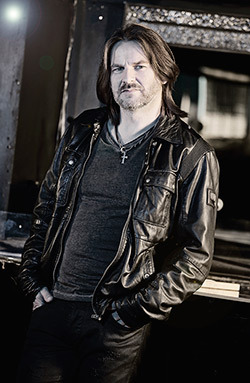 Ray Wilson never got to leave his Genesis past behind him. At times he would not, at other times he could not. 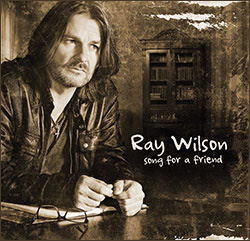 Whatever people might think about his contributions to the Genesis album that has come out nearly twenty years ago, they should remember that Ray Wilson has been releasing interesting solo albums for many years now. Change and SHE, for example, were outstanding releases. In recent years he has written and produced good songs and albums, but there was a sense of stagnation there. After the 2013 Chasing Rainbows there was a subliminal urge to reposition. The original idea for the album title was Backseat Drivers. It was to be a double album. Ray wanted to have one CD with acoustic music and a second CD with electric music. At the eleventh hour he decided to split the two. In an interview with Genesis-music.com (to be available soon) he explains why: The acoustic version of Song For A Friend would not have got the attention it deserves. The second album, tob e released in autumn, will be called Makes Me Think Of Home. 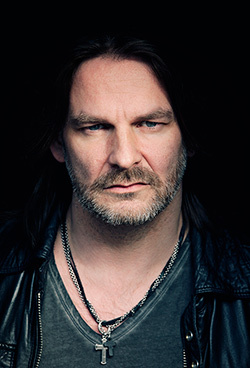 Two elements have been retained from the Backseat Drivers idea: One is the song Backseat Driving on Song For A Friend, the second is the fact that Uwe Metzler was been significantly involved in all songs. Song For A Friend has a breezy arrangement, but the songs are thoughtful and frequently melancholy, though they never lose the dimension of hope. Ray dedicates the album to a late good friend of his. More on this later. When I started to listen to the album I had to deal with a loss myself: My father passed on, and I suddenly gained a completely new view to many songs on the album. I had a positive attitude towards the album from the start, in fact, I feel that he has achieved something major here – the circumstances made the album far more intense. This is the particular music of music: When she grips you it is one of the most wonderful things that can happen. Song For A Friend is, however, anything but just an album about loss. It is, most of all, a very direct album, and the melancholy gives it enormous depth. Ray’s voice, the reduced arrangement in most songs and the easily graspable length of ten tracks make Song For A Friend impressive. There is no catchy hit song that is going to be played on the radio all the time. There is, however, a number of fine melodies and remarkable arrangements. Ray himself describes the album as a collection of small and big stories. When the album begins with this song there is the impression that the band is warming up. Ray begins with a kind of sprechgesang, but with the chorus comes the magic. Ray really has a knack for conjuring up catchy chorus melodies. This one is not into your face. The lyrics have no personal dimension, it is just one of Ray’s stories. In this case it is about being happy with yourself, wrapped in the story of a frustrated bar patron who discovers an Old Book On The Shelf, reads it and finds it own story in it. The title itself is gloomy. The song is about two friends who lose sight of each other. One of them takes his life in his hands while the other let himself go. In the end they meet again at a funeral. The essential parts of the song are the acoustic guitar and Ray’s vocals. The chorus is very interesting as it is very deep and up-beat. Interesting structure, too. Cold light follows cold body. The song resembles the previous one. It may not by as strong, but it is still far from irrelevant. And it has another fine chorus. The song is about jealousy and bitterness and about how those feelings destroy only the jealous and bitter person but not those the feelings are addressed to. The title song lies at the core of the album. Ray’s best friend of his youth took his life after a swimming accident tied him to the wheelchair. Ray remembers their friendship and tries to imagine the moment of death from his point of view. As he explained, Ray recorded the vocals just once. It made him cry, and as he felt the recording was so intense he left it at that. It is an uptempo song full of sadness. Certainly the central element of the album. The topic remains, the music changes. At some moments it resembles Rhianne from the previous album. Ray tries to understand how his friend may have felt as a disabled man. The music is demanding with lots of emotions, chords and vocals. This song will stick in your mind. And it contains real drums. This good pop song is full of hope. Ray wrote it for his partner who was devastated when she injured herself during a dance tour. Not Long Till Springtime is the first single. There may have been a better choice, perhaps. The song has the peculiar line „good things come to those who fight to win the day“. On earlier albums Ray would sing variations on „good things come to those who wait“. Times change. This would have been the title song of the original album. A fine song that sticks in your ear, it is about life on tour and the various languages, discussions situations – compared with political propaganda of lies and fear. A song about spirituality, the fourth dimension many of us feel but cannot explain, and how it helps us through life. The track has a wonderful structure and runs a varied course. Lie-la-lie, lie-la-la-la lie-la-lie. Ray discovers the campfire for his music. A song about a woman who kept making false decisions and having the false partners, but finally „freed“ herself. The song works fine though it is unobtrusive. Yes, it is the Pink Floyd song from their album The Division Bell. Ray is known to like Pink Floyd and to play the odd Floyd song live – also for Ali Ferguson who is an even bigger Floyd fan and gets to sing it. Ray has never been one to record cover version, though, which makes the inclusion of this song peculiar. What is even more peculiar is the fact this on this song Ali Ferguson plays – nothing. In the end Ray produced a very fine version of this song in the overall style of the album. The keeps close to the original, but he puts his stamp on the song with his voice.. Even though we do not know the second album, we venture to say it was a good idea to release two different albums that are musically different, too. You can have Song For A Friend play in the background and just listen in occasionally. But that would mean throwing pearls before the swine. The album has depth, it is all of a piece and does not get boring though there are basically always the same instruments. It is a great advantage that Ray limited the album to ten songs that add up to a bit over 40 minutes. This coherent album culminates in High Hopes. What’s more, Ray has never created such good surroundings for his voice – never has the songwriting been better. This is Uwe Metzler’s merit. Song For A Friend could be the album with which Ray could win new albums. As a musician, it is a big step forward for him. Song For A Friend has been released as Digibook. It is available on Ray's website, amazon-uk, amazon.fr and amazon.com.